Daylesford has become one of my favourite places to visit ever. I've only been twice, but the two times I have been I've just been so happy to be there. My last visit filled me with so much joy that I thought I had to write a blog post about it! 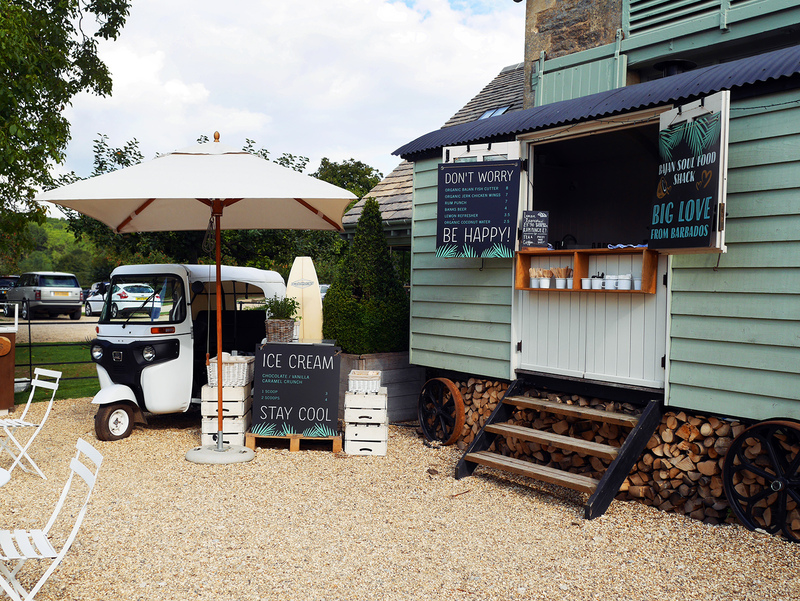 Driving through the little village is just how you would imagine the Cotswolds to be, flowers everywhere, animals grazing in the fields and lots of little cosy cottages. Once you've arrived you're greeted by blooming apple trees and colourful leaves on the floor, I think the changeable weather was making the trees a little confused. They've recently just opened up the garden, which is a shop is dedicated to their love of horticulture and is inspired by all of their organic farmland, hedgerows and seasonal blooms! As I'm sure you'll agree from the pictures below, it is so stunning. I felt so inspired I bought a Brassica plant and a gorgeous teal plant pot from there for £10, which I thought was such a great deal. If you're feeling hungry why not stop of at the farmshop to pick up supplies for a luxurious picnic or simply have a delicious organic pizza from The Old Spot. I had the mozzarella, tomato and home-made pesto pizza, this one of the best I've ever eaten and I've eaten A LOT of pizza's in my life! I think it was all of the organic ingredients, it made such a difference. From the farmshop I'd really recommend their dark ginger sticky cake and gluten free lager! There you have it, my little round-up/review of Daylesford! If you have any recommendations of places to visit in the Cotswolds please let me know as I'm sure I'll be back soon! I've just moved to Bath, so I'm super excited about visiting the Costwolds this year! Daylesford seems like it has lovely gems, I hadn't heard about this particular village before but the pizza sounds great so I might have to go and eat there haha! Well if you want to go back in the area I'm sure you've heard of Castle Combe, it's such a famous little spot - and I'm sure it looks as pretty in real life as it does on pictures! Bath is so pretty! I've only been once for a short weekend break but I'm sure there's still so much more for me to see!